Star Wars Insider has proven again that it's an invaluable resource for fans of the Star Wars movies and everything that goes into making them. Volume 2 is just as diverse and varied as Volume 1, but with a little less focus on the stars and a little more focus on everyone else. It's also chronologically less limited to what it was like before the movies came out, and it begins to discuss what happened between films and a little of what happened after. Volume 2 has a lot of interesting details about how the earliest works of the Expanded Universe, especially the comics, happened, featuring interviews with some of the earliest artists and writers. It goes on with discussions about how the story was adapted and expanded through them, into some of the novels, and through to the Clone Wars and Rebels TV series. There are several articles about how various creatures were created, most notably fan favorites Yoda and Chewbacca, as well as some of the practical effects from the original movies. In a few of the interviews, there are peeks into how influences and ideas that didn't make it into the original trilogy eventually surfaced in the prequel trilogy, and it makes a pretty good argument that the prequel-bashing that tends to happen in some fan groups isn't fully justified. This second book in the series—two more are slated to come out this year—maintains the upbeat tone and thoughtful consideration of the articles collected in the first volume, and it makes the book an enjoyable, entertaining, and informative read, not just for fans of the movies, but also for people interested in how movies get made, and the behind the scenes ups and downs that can shape what can happen on screen. One of the most interesting things about this volume is the glimpses into the scope of Lucas's vision. Before the movies were even complete, he was already thinking about how to make them and their world bigger. In the interview with Edward Summer, about halfway through the book, he talks about how Lucas had an idea to have a string of stores in all the major cities across the country, selling Star Wars art prints and merchandise. In many of the articles, the interviewees note how young and inspiring Lucas was, and how he recruited people who may not have had many impressive credits, but who proved to be talented in new and unexpected ways. The gestalt of all that talent was a series of movies not like any others. 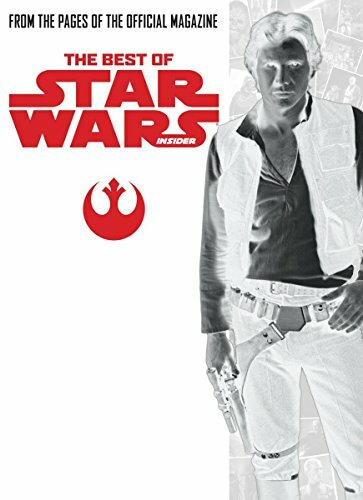 Toward the end of the volume, it branches a little into the legacy of Star Wars: the way it has affected people's lives, both the stars working the Convention Circuit and the fans who attend their events. Volume 2 is starting to look at what it means that Star Wars exists, both the original movies and the new shows made by people who grew up with them—for the actors of small parts beloved by fans and the fans themselves, and even, just a touch, on the wider world of film it influenced. Where Volume 1 was a compilation of very early articles giving us a look at what Star Wars was before it hit big, Volume 2 is a look at what was going on while it was hitting big, the opportunities it opened, some of the chances that were taken, and a lot of the careers that were built on its success. Artists who cut their teeth on Star Wars went on to make many of the best movies in the decades after. If you're looking for interviews with the stars, this volume may not be as pleasing as Volume 1, but the expansion of what counts as a star on these films is worth it, and the articles are all fascinating and clear. The Best of Star Wars Insider Volume 2 proves that almost everyone who worked on these films is an artist and a star in his or her own right, and that the influence of these movies carries into the real world where the viewers live, too. In this volume, the wider world of Star Wars is introduced, and it's as full of art and daring as the movies themselves.